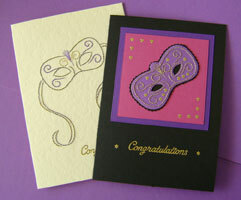 A simple Venetian Mask with full instructions for creating a multilayer Card. Stitched in Black/Rainbow Variegated ‘Glitz’ Thread or Gold ‘Glitz’ Thread. A single Peacock Feather is a pretty decoration for an All Occasion Card or a Notebook Cover. Stitched here using Madeira ‘Shot’ Peacock thread and other Metallics on an embossed Card.